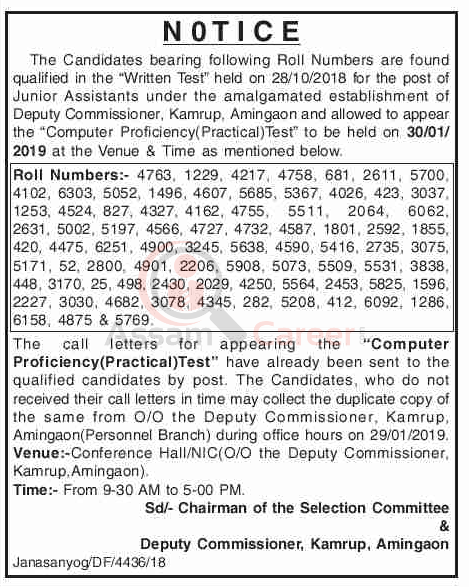 The Candidates bearing following Roll Numbers are found qualified in the "Written Test" held on 28/10/2018 for the post of Junior Assistants under the amalgamated establishment of Deputy Commissioner, Kamrup, Amingaon and allowed to appear the "Computer Proficiency (Practical) Test" to be held on 30/01/2019 at the Venue & Time as mentioned below. Roll Numbers:- 4763, 1229, 4217, 4758, 681, 2611, 5700. 4102, 6303, 5052, 1496, 4607, 5685, 5367, 4026. 423. 3037, 1253, 4524, 827. 4327. 4162, 4755, 5511. 2064. 6062. 2631. 5002, 5197, 4566, 4727, 4732. 4587, 1801, 2592. 1855. 420. 4475. 6251. 4900, 3245, 5638, 4590, 5416, 2735, 3075, 5171, 52. 2800. 4901, 2206. 5908. 5073, 5509, 5531. 3838. 448, 3170, 25, 498. 2430, 2029, 4250, 5564, 2453, 5825, 1596, 2227, 3030, 4682, 3078, 4345, 282, 5208, 412, 6092, 1286, 6158, 4875 & 5769. The call letters for appearing the "Computer Proficiency (Practical) Test" have already been sent to the qualified candidates by post. The Candidates, who do not received their call letters in time may collect the duplicate copy of the same from O/o the Deputy Commissioner. Kamrup, Amingaon(Personnel Branch) during office hours on 29/01/2019.